The strong binding of gold on electronically modified calcium oxide can now be understood in detail. In a computational study, researchers at the University of Jyväskylä Nanoscience Center have shown how redox chemistry entirely determines the adsorption strength of gold on the modified oxide where one metal atom is replaced with molybdenum. The research team applied the so-called Born-Haber cycle to analyse how different terms contribute to adsorption energy. The calculations were done at the supercomputers of the CSC – IT Center of Science by employing quantum mechanical simulation methods. In the oxide lattice, the molybdenum atom donates two electrons into the oxide. When a gold atom adsorbs on the oxide surface, a redox reaction takes place. In this process, a third electron transferred by the dopant is gained by gold, and energy is released. By varying the dopant among several transition metal atoms, the researchers found that the amount of energy released linearly correlates with the ability of the dopant to give an electron. The trend can be used to estimate how much a guest atom stabilises gold adsorption without calculating the adsorption energy. The research results are important for understanding catalyst-support interaction. The results fully support the experimental observation where gold nanoparticles have been seen to form flat structures over modified calcium oxide surfaces. A similar Born-Haber cycle, as applied in this study, can also be employed to analyse oxide-catalysed chemical reactions that follow the redox mechanism. Catalysts are commonly used by industry, for instance, in the production of fuels, plastics, fertilisers and other similar products. Metal oxide surfaces are widely used as support materials for metal catalysts particles. The binding properties and shape of metal nanoparticles sensitively depend on the interaction between the support and the catalyst. By tuning this interaction, it is possible to affect the number and properties of catalytically active sites, or even create new sites. 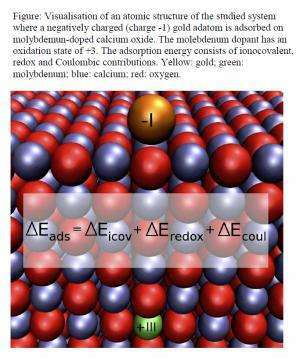 One way to modify the interaction is to dope the oxide with guest metal atoms that can donate extra electrons into a material.